Situated in the stunning Apokoronas region, to the East of Chania is the popular tourist village of Kalives. Famous for its picturesque setting, ‘blue flag’ beach and quaint tourist shops and tavernas, Kalives is an ideal destination if you are looking for a quiet, relaxing holiday away from the hustle and bustle of many tourist resorts. Although Kalives is typically quiet and tranquil, there is plenty to enjoy during your stay, including wonderful restaurants where you can enjoy authentic Cretan food, many nearby attractions, not to forget the stunning Kalives beaches - a must see if you are visiting! There are also many places to stay within close proximity to the Kalives area meaning you have a wealth of choice whether you are visiting as a young family, a group of friends or a couple. The Kalives really is a wonderful place to visit and will truly lift the weight of everyday life from your shoulders! Not much can come close to eating delicious food with the sun on your shoulders overlooking crystal clear waters and white sands. 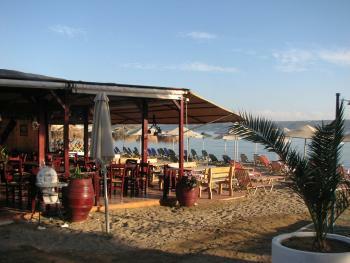 Kalives has plenty of beach side restaurants for you to enjoy to your heart’s content. Think fresh fish, slow cooked lamb, rice dishes and crisp salads all accompanied with chilled, local wines. The wide range of family friendly restaurants offer both local and international cuisine, many of which will leave you wanting more! However, if you would like something a little more sheltered, the various restaurants tucked away in the Koumos courtyards will be sure to tickle your fancy. This majestic yet tranquil setting paired with wonderful food make for an unforgettable, romantic evening with plenty of hidden gems to choose from. Although Kalives is known for its peaceful atmosphere, there is lots to see and do close by giving you the best of both worlds, particularly if you are travelling with adventurous children! We would recommend considering car rental if staying in Kalives if you would like to take advantage of the local attractions as most are half an hour to an hour’s drive away from the resort. Visit the Botanical Park, Chania or the Water Cemetery at Souda Bay to see some truly stunning views, Cretan history and culture that you simply won’t find anywhere else. The Ancient Aptera archaeological site is also excellent for learning more about ancient Cretan history by admiring findings in the once most powerful city of Western Crete from various different periods. If you are looking for a fun, family day out, the Limnoupolis Water Park is a popular choice and only half an hour’s drive away from Kalives itself. Based on 65,000 square metres of land, the park offers plenty of slides, rides and swimming areas, injecting some fun into your Crete holiday - a great choice for those travelling with children! Being a popular tourist destination, there are plenty of places to stay within close proximity to Kalives all of which have private pools. We have a wide range of Villas available in the Kalives area with great access to other villages including Almyrida, Kokkino Chorio, Plaka and Aspro. Villa Kallisto for example is an ideal choice if you are looking for a luxury villa for a larger group. With 4 bedrooms, 4 bathrooms, a private pool and sea views there isn’t a lot this villa can’t offer you. There is space to sleep 9 people making it ideal for those travelling with extended family and is situated amongst magnificent views of Souda Bay and The White Mountains. A great location if you want to be close to Kalives! 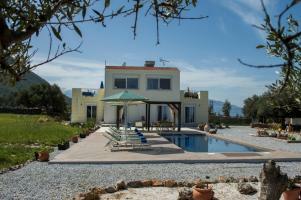 Villa Artemis is also a fantastic option. It embodies the look and feel of a traditional Greek villa, has stunning sea views and is located close to Kokkino Chorio, overlooking Souda Bay. With capacity to sleep 6, a private pool and plenty of outdoor space you can make the most of the glorious Cretan sunshine with your loves ones and watch the world go by on the beautiful terrace. Many of our villas are also eligible for Low Occupancy Discount Rates and can be booked with just a 10% deposit! We still have availability left during May, June and July so book early to avoid disappointment. If you would like more information on our villas located near Kalives take a look here, or get in touch on 0330 111 0061.